In verse 8, Peter describes our spiritual opponent as a roving and roaring lion looking to swallow whole those who are not alert to his mission. Heeding this warning, it is appropriate that we make ourselves more aware of this enemy. To help us in this effort, the following study is presented. 1. Look but don’t stare. When compared to the message of God’s word that speaks to the threats of our own personal sinful desires and the work of the unbelieving world, there is very little detail given about the inner workings of our spiritual opponent. If we were supposed to spend a great deal of time and attention on the person and work of the Accuser, we would have been given more detail and background. As it is, we should learn from the paucity of biblical information and make the choice to not spend too much time dwelling on our defeated spiritual enemy. Given our desire to know everything about everything and the lack of detail surrounding the biblical message on our spiritual opponent, many seek to satisfy their need for more by going well beyond the Bible. There are lots of people at work today and even more who have been at work in the past, who have taken the pieces of the biblical message and used them to weave many exciting and compelling narratives about the origins and everyday affairs of our spiritual opponents. These non-biblical extras need to be avoided. We need to learn to live with a little uncertainty. If God wanted his people to take such a deep dive into the Father of Lies (John 8:44), more would be given. Instead, we would do well to spend our time on seeking to glorify God in our study and application of the biblical message rather than spending our precious attention on made up stories. Who is our spiritual opponent? First off, we need to know who we are talking about. To help with this, we should get our head around some of the ways this spiritual opponent is referenced in the biblical message. In Genesis 3:14 the one who tempted Eve to challenge the command of the Creator which led to the first sin of mankind was called a serpent (Hebrew: Nachash). The Hebrew Bible refers to the work of a spiritual opponent most often by using the common term used to describe someone who stands in opposition or someone who accuses others of wrong doing. This term is transliterated into English as Satan. This is not a proper name, as the same word is used to describe the action of opposing all throughout the Hebrew Bible. However, there are a few clear examples of how this term was used as a proper name to describe a spiritual actor that was engaged in the accusation of God’s people. At the beginning of the book of Job a scene is described in a highly stylized and literary fashion that refers to the antagonist as Satan, or the accuser. This entity is not a character in the story beyond the initial action of testing or trying the validity of Job’s faith. The accuser acts under the authority of God and has limited freedoms. In 1 Chronicles 21:1, King David is tempted by the Accuser (Ha-satan) to go beyond his mandate and to take a census or count of the fighting men of his armies. This was seen by all as a blatant act of pride and David was punished for his open rebellion against God. In Zechariah 3:1-7, a prophetic vision is described that resembles a court room setting. Joshua the High Priest is shown to be standing for trial and the prosecutor is referred to as the Accuser (Ha-satan). The Accuser is rebuked by the Lord and a defense is given for Joshua. In the 400 year period between the closing of the Hebrew Bible and the birth of the Christ, literary examples that expanded on the character and activities of the spiritual opponent increased exponentially. These intertestamental writings vary tremendously in their presentation of the Accuser and show a much more nuanced treatment of the spiritual forces at work in the world. None of these writings are held to be as authoritative or inspired as those included in the Christian Bible, but they do show that spiritual opposition was on the minds of those surrounding the Christ. Without attempting an exhaustive list of references to the character and work of the spiritual opponent, the following references highlight the more nuanced and developed understanding of the Accuser. Jesus faces an extreme trial in the wilderness. In addition to the trials of hunger and isolation, Jesus Christ is placed under trial by the Accuser, also referenced as the Devil. The term, “Devil” is again, an untranslated Latinization of the Greek word for one who is a slanderer or liar (diavolos / diabolos). In this setting, the Accuser places Jesus under a series of trials that are meant to test him in all the ways that are common to mankind. Jesus resists and passes the test. All of these events are sanctioned by God the Father and serve a needed function to demonstrate that the Christ can identify with our times of trial. Matthew 13:19 When anyone hears the message about the kingdom and does not understand it, the evil one comes and snatches away what was sown in their heart. This is the seed sown along the path. John 14:30 I will not say much more to you, for the prince of this world is coming. He has no hold over me. In these, and in many more, Jesus Christ teaches that the Accuser has fallen from the role of prosecutor or tester of mankind and has moved into attempting to actively lead humanity into sin rather than to perform what is seen in the Old Testament function. In the minds of the early church, the Accuser is more than simply the antagonist in the story of Christianity. This spiritual opponent is actively affecting the unbelieving world and seeking to bring the church into a place of trial and testing. Next we should look to the biblical message concerning the origin of the Accuser. There is no one clear reference to the origins of the spiritual opponent. What can be said about the origins of the Accuser come from a small scriptural collection. There are only two clear and definitive references to the background of the Accuser. 7 And there was war in heaven. Michael and his angels fought against the dragon, and the dragon and his angels fought back. 8 But he was not strong enough, and they lost their place in heaven. 9 The great dragon was hurled down — that ancient serpent called the devil, or Satan, who leads the whole world astray. He was hurled to the earth, and his angels with him. Neither of these references should be taken as straightforward descriptions of events as they happened. The passage from Revelation 12:7-12 is tucked into the middle of a collection of broad and historically anachronistic allegory. The events in this passage are to be interpreted as one might with poetry. In the reference from Luke 10:18, Jesus is instructing his disciples to not get too excited about the fact that they have had success against their spiritual opponents. The language used here was widely understood to be a reference to the fall of the Accuser as described in popular Jewish apocalyptic literature written in the intertestamental period. But without any expansion on the meaning of this reference, all additional commentary is guesswork. Two additional Old Testament passages are often referenced as possibly being connected to the origin of the Accuser. But in both references, the prophecy had a direct connection to the people and events that surrounded the prophets. In the first passage, the prophet Isaiah wrote about the rise and fall of the king of Assyria. While the language used fits with the later view expressed in Revelation 12, there is no obvious connection to events outside those being witnessed by the prophet and his audience. Many Christian writers in the second and third century AD made the connection between this prophetic message and the comment Jesus made in Luke 10:18. This connection is hard to discount but it is equally difficult to support due to the lack of follow up or explanation surrounding Jesus’ statement. Another message given by the Hebrew prophet Ezekiel uses language that has often been taken as an allegorical reference to the fall of the Accuser. The language is striking as is the opening reference that ties this message to the specific leadership of the city-state of Tyre on the coast of the Mediterranean. 12 “Son of man, take up a lament concerning the king of Tyre and say to him: ‘This is what the Sovereign LORD says: “ ‘You were the seal of perfection, full of wisdom and perfect in beauty. 13 You were in Eden, the garden of God; every precious stone adorned you: carnelian, chrysolite and emerald, topaz, onyx and jasper, lapis lazuli, turquoise and beryl. Your settings and mountings were made of gold; on the day you were created they were prepared. 14 You were anointed as a guardian cherub, for so I ordained you. You were on the holy mount of God; you walked among the fiery stones. 15 You were blameless in your ways from the day you were created till wickedness was found in you. 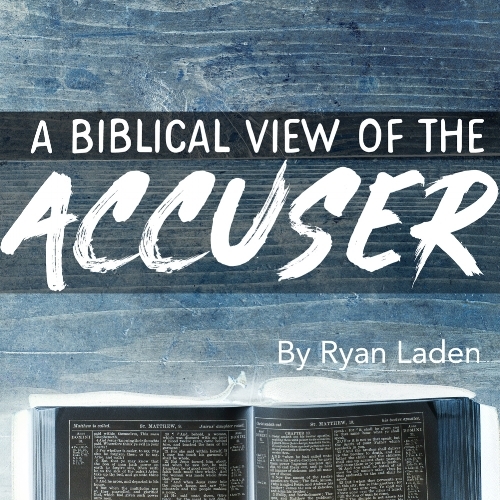 There are more possible connections to the fall of the Accuser in the Old Testament but none are as well used by the later church as these two. They are powerful in their language and imagery and fit neatly within the later Christian narrative surrounding the fictional image of Satan given by later wristers like Milton and Danté. Strong arguments can be made to support the inclusion or exclusion of these potential origin prophecies. As such, the Christian ought not to entertain teaching concerning the origin of the Accuser taken from these prophecies unless it can be supported by other clearly understood references. If all we knew of the Accuser was limited to the message of the Old Testament, we might conclude that the Accuser played a well-regulated function in God’s economy. The Accuser challenged the faith of God’s people, not for evil purposes, but so as to bring about some change in those being tested. This same God appointed function is hinted at in the later New Testament materials. It would seem that this Accuser, even in its perverted state, still functions to bring about change in the hearts and in the faith of those who call on the name of the Lord. The Accuser who had the role of testing the faithful was welcomed into the counsel or presence of the Lord. This implies that this testing function once served God’s purposes for his children. This Accuser is the same one who rebelled against the Lord and was overcome by the blood of the Lamb (Jesus Christ). So this Accuser is still performing its intended function, even in this fallen or perverted state. The Accuser seems to be still performing this testing and challenging function for God’s people, under the limitations and authority of the Lord God. 6 In this you greatly rejoice, though now for a little while you may have had to suffer grief in all kinds of trials. 7 These have come so that your faith — of greater worth than gold, which perishes even though refined by fire — may be proved genuine and may result in praise, glory and honor when Jesus Christ is revealed. According to the Apostle Paul, at this present time, the Accuser will continue to be active in the world and in the lives of the believer until the final judgement. 10 Finally, be strong in the Lord and in his mighty power. 11 Put on the full armor of God so that you can take your stand against the devil’s schemes. 12 For our struggle is not against flesh and blood, but against the rulers, against the authorities, against the powers of this dark world and against the spiritual forces of evil in the heavenly realms. The unbelieving world ignorantly submits to the influence of the Accuser but the believer in Christ is to trust in the victory of Christ and resist the trials and temptation of the Accuser. At the final judgement, the Accuser is scheduled for destruction, which is held as an act of justice by all. Matthew 12:41 "Then he will say to those on his left, `Depart from me, you who are cursed, into the eternal fire prepared for the devil and his angels. 7 When the thousand years are over, Satan will be released from his prison 8 and will go out to deceive the nations in the four corners of the earth — Gog and Magog — to gather them for battle. In number they are like the sand on the seashore. 9 They marched across the breadth of the earth and surrounded the camp of God’s people, the city he loves. But fire came down from heaven and devoured them. 10 And the devil, who deceived them, was thrown into the lake of burning sulfur, where the beast and the false prophet had been thrown. They will be tormented day and night for ever and ever. 14 Then death and Hades were thrown into the lake of fire. The lake of fire is the second death. 15 If anyone’s name was not found written in the book of life, he was thrown into the lake of fire. As has already been mentioned, the Accuser has been condemned as one who has rebelled against God is now awaiting the final act justice. As the salvation of Christ is only afforded to repentant creation, the Accuser has no hope of altering the judgment that has been proclaimed. This is why Peter refers to the Accuser as a “roaring lion looking for someone to devour”. While this enemy is to be heeded, the Accuser has no power over those who are in Christ. This is why Peter can instruct the church to resist the Accuser by standing firm in their faith. Christ has won the victory and we are included in this gift of mercy.